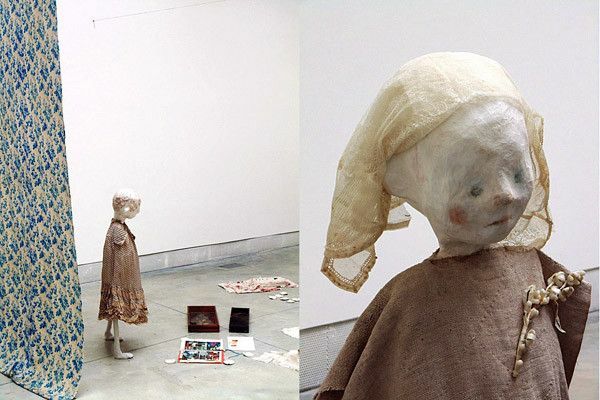 Cathy Wilkes (b. 1966, born and raised in Belfast) is a protagonist in the Glasgow art scene that rose to international prominence in the late 1990s. Though an early pioneer of this group of artists, her consistently tough work with social realist human representation has made her a unique figure within it. Her practice – an equal mix of sculpture, painting and installation – demonstrates a way to redefine genre painting for the present day. These genre images are now created using mannequin figures or dolls and various types of found objects and materials, which are linked to sculptural and spatial scenarios. Wilkes’ sculptures have a painterly quality, as they have often been processed using paint or even dirt. She also creates paintings and variously-processed canvases and wood panels, which have the look of traces or very quick sketches of existential situations: a far cry from familiar, historical genre painting, Wilkes’ painting is more abstract, more material and immaterial at the same time. Wilkes confronts viewer attitudes that prefer to understand abstract work as non-binding, formalist, pointillist or gestural, challenging them to experience another attitude through her constellations: in this case, everything abstract is imbued with the social, psychological and real. These supposedly “pure” paintings by Cathy Wilkes are every bit as physical as her mannequin figures and ghostly dolls, and as much a human representation as the nudes she places in the room or drapes with pale fabrics. This constellation of elements creates an utterly ambivalent intensity that makes Wilkes’ work so outstanding and unique (probably only comparable to the work of the German colleague Kai Althoff): in it we find a deep sadness, an existential representation and exhibition of life and death, a depiction of mourning – like a dramatic scene on a fictional stage. Especially considering the latter, it seems important to show Cathy Wilkes – who is now receiving her first institutional exhibition in UK – in Germany as well: after all, Wilkes helped invent the tropes of modern existentialism and Brechtian theatricality so popular in contemporary art today. A viewer of her work experiences the transformation from an exhibition space to a theatrical stage-space, into a living space, into a nightmare – and is actually gripped by the process. Cathy Wilkes is an artist who exhibits rarely and with great care. The concept of this exhibition – which will take very different forms in spaces at TATE Liverpool, Lentos Museum Linz and Museum Abteiberg – combines works from different stages of her career: a collection of works since 1998, both installations and sculptures as well as paintings and sketches, which the artist has linked and is now merging into one large work. With the owners’ consent, these works from private and museum collections will temporarily lose their outlines and borders. In an act of comprehensive artistic reappropriation, Cathy Wilkes fuses all of them together to form a large, spatial installation.